Hikari had been a bit preoccupied with thoughts as Hinami did her thing again, and allowed it to continue further than she'd normally have. Still, she did eventually add some thoughts of her own, meant to soften the mood. "We can not expect those not born and raised in Rokugan to understand the rules of Imperial etiquette, sister. We must make for some allowances and patience." Akaichou bowed again. "I appreciate your patience. Perhaps when this attack upon you is over, you might both consider to honor me with knowledge of proper etiquette so I do not make further mistakes." The Ide felt grateful that she had learned conversational Rokugani with a slant toward words she would use as a courtier. It was turning out to be surprisingly useful in beach-side rescues and stolen jade recovery. A larger man approached them. Akaichou immediately recognized he was a Mamluk guard. He spoke to her in Mekhem, which caused the girl to look in the direction of the stall she'd retained help from, seeing him back at his post. "Thank you, I shall ask." She turned to the sisters. "This man guards this area. The man I asked for help lost the boy in the crowds and went to the proper guard. He asks if you saw the boy and what he looked like. I can translate, if you permit me." She gave a description as best she could; which was probably so generic as to be completely useless given how little she actually saw of him. Hinami looked at the gaijin woman as she bowed and raised her fan once again. It would seem that the gaijin woman was a quick learner, maybe she was not completely barbaric like the rest of the gaijin. '' Good '' She said to Akaichou. Then she turned to her Hikari. '' That's why I gave Ide-san the oportunity to correct her mistake, dear sister. I'm not that harsh, one minor breach of etiquette can be forgiven. '' She replied to Hikari. Then the mamluk guard approached. Hinami already knew a bit about of them, since she met with their commander yesterday. '' What's the name of their commander, Ide-san? I met him yesterday but I didn't catch his name...'' She asked. Akaichou asked and the guard replied himself, "Fuad al-Maut." Then he had a question for the girls which caused the translator to look down in surprise and awe. "He asks if that is a cat holding your jade?" She looked down. And then took a knee herself. "Good Azuki," she said, clearly pleased as she'd take the jade from him and petted him. "See," she looked up at Hinami, "I told you he was a good kitty!" '' Fua...Fuadu Alumautu? Fuadualu Mautu?... '' Hinami tried to vocalize what she heard but clearly she failed. By the Seven, is that even a name? Which part is his personal name? These savages and their barbaric languages...can't they spoke Rokugani like the rest of the civilized world... She thought. Then her sister's famous pet appeared. Hinami observed the strange being, intently inspecting the feline critter.
'' Hmph, I'm not convinced...'' She replied. The Ide thanked the Mamluk for his time and he went about his duties. Up the street was Dar Al-Shifa where she was staying. Tristan ran ahead and entered, knowing where they were headed. Upon entering a scent of spices and herbs surrounded them. It was not too strong, but definitely there. It looked as though her host, Ide Mohan, was busy as was his wife. "I am staying upstairs. If you feel safe, we can go. If not, I understand. There is something I wish you to see, but after the thief..."
"We can go," she said, making sure the jade was secured away and looking at her sister with a look of 'don't be difficult'. She lead the girls up to where she was staying. Tristan was already waiting for them, his tail wagging happily from one of the pillows on the floor. 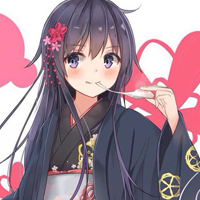 There was a bed, a place for valuables, and the chests Akaichou had brought along, as well as assorted belongings like candles and calligraphy set, as well as a tea set for ceremony. She set out pillows for the sisters to kneel on as she went to one of her chests. "I must ask; are all cats trained to help their owners in such a way as we saw earlier?" "One can not train a cat," she said, a finger lifting to her lips as she looked up at the ceiling. "At least not the small kind." Akaichou produced a long, rectangular box from her chest. It was wrapped in very fine cloth and could not be seen directly. The way she handled it was noticeably reverent and graceful, although she were both humbled and empowered by merely holding it. She set it down between the 3 pillows meant for kneeling, placing it on a fourth pillow in the middle. Before unwrapping the contents, she said a prayer in her mother tongue although if one were discerning they might notice a mention of Shinjo. She had a solemn, serious look about her as she pulled the cloth back one fold at a time. It was a box, as one would expect. However, it was obviously oiled and simple yet somehow ornate. In the middle, majestic eyes and fiery hair, powerful and proud. It wasn’t carved exactly; or maybe it was, but it made the wood darken as well causing the horse to look alive. The Mon of the Ki-Rin. "No one outside my family has seen this." Hinami observed the chest and the mon. 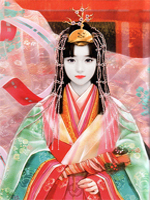 She was not particulary well versed on history, but she has seen the old mon of the Ki-rin clan still hanging in the throne room of the Imperial palace in Otosan Uchi. It was authentic but this did not make any difference, since it could had been stolen by this gaijin woman or her ancestors.
'' It certainly looks like the mon of the Ki-rin clan, there's no doubt in that. I have seen it still hanging in the throne room in Otosan Uchi, but a chest does not prove anything i'm afraid, Ide-san. Besides we don't have the power to proclaim that your 'claim' to be a descendant of one of Shinjo's-no-kami followers is true.'' She said.
'' Only the Divine Emperor has the right to declare such announcement. Only him has that power. But we could at least bring this matter to the Imperial Prince, Hantei-no-kimi'' She said respectfully. "I see no reason to doubt your claims, but my sister is correct. And many questions remain unanswered. Where did the Ki-rin go? How is it that they are here, as the Ki-Rin did not leave by the sea. How much have the Ki-rin changed, and so on?" Carefully, she removed the lid which revealed nothing at first save for another cloth. Finally she opened the cloth with the utmost care. Inside lay a wakizashi. It was ancient, having survived centuries but was immaculately cared for. She lifted it as though holding something she dare not. It bared the crest of both the Unicorn and the Ide. "Like you, we used to carry these on our hips. However, as an Emissary one is often in a room to keep peace between others. Having a weapon cannot help and causes problems. It is not the tone we must set. We learned to keep our honor safe and well-cared for. Others in our clan have different rituals but very few still wear their wakizashi. They are one of our last pieces of Rokugan that we can hold." She lowered in back into its place, mon still plainly visible. She finally made eye contact with Hikari and smiled. "I don't have all the answers, and may not speak Rokugani well enough for others, but I can tell you what I know." '' The wakizashi represents your honor and membership of the samurai caste, Ide-san. It may be a weapon, but it is also a symbol of -who- you are.'' She commented, while she observed the gaijin sword. It was in excellent condition. '' If you don't carry it around, how can others identify you as a samurai? If you don't carry it how can you defend your honor and that of your ancestors?'' She adds. She inclined her head slightly. "There are courtiers and shugenja who carry their katana as well of course, but it is rare. And a samurai not carrying a wakizashi is rarer still. It is a weapon, but aside from those who practice rare styles such as niten, it is almost never used against another person." "Think of a new person coming to Rokugani court with a sword you've never seen at their hip. It may be traditional for them, but for you it would feel dangerous. When an Ide comes to negotiate peace, they cannot have a weapon and hope to be an Emissary of peace. It does not set the right tone. They have no way to know you aren't lying when you say it's not for them. And we still don't trust... sword workers? to handle them. Only a few among the clan. So after the time spent in the burning sands, most were not in proper condition." "This is part of how we are everywhere, or at least known everywhere. We've grown strong." She said with a soft, nearly proud smile. "You've mentioned your Emperor. Does this mean you don't plan to stay?" "While I can see that there may be times when it is practical to not wear one's wakizashi... it is something that will not be looked upon favorably by most in the empire, given the sacred nature of the blade and the purpose it carries." She then listened to the history, quite fascinating though keeping her own view on the meaning of it all. "And how many of you are there?" "A good number. But so many families lost their wakizashis in war as well as their jade. It's why they have become precious... Hmm, what's the word for something one gives on to their children?" She shook her head. "And forgive my manners. I meant to ask that of you. Did you all survive? Are you faring well? Ide Mohan is someone that Unicorn from all over the continent seek out for medicine."